With handling up to 3000 watts, the PVTC series step up/down voltage transformers offers you a safe, dependable, cost-effective, and easy solution to converting voltages from 110-120 volts up to 220-240 volts or from 220-240 volts down to 110-120 volts for both home use & commercial applications. This converter is perfect for running larger 220 volt appliances like A.C. units and refrigerators on your standard 110 volt outlets. 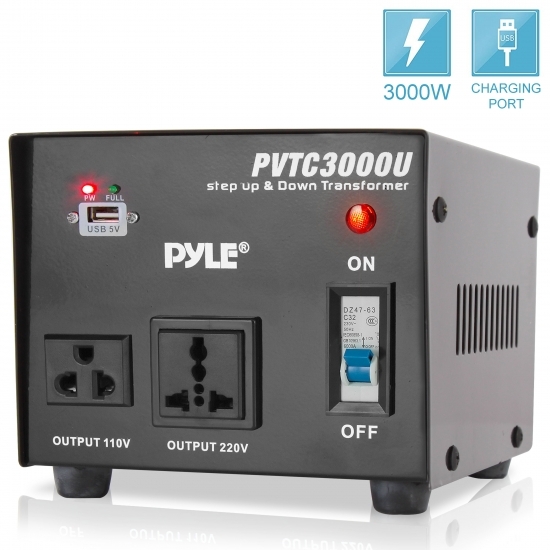 The PVTC 3000U comes with a power rating of 3000w, a heavy-duty power cord, a standard US 3-prong plug, and an American to European outlet adaptor. There are a total of three outputs on the front panel. Two are grounded outputs, one designated for 120 volts with a US standard outlet. The other output is for 220 volts only with a universal outlet. The last one is a 5V standard USB jack. And most importantly, all three outputs can be used simultaneously & continuously.For safety, it's recommended by the manufacturer that the voltage transformer's maximum power should be equal or greater than the power rating of your appliance multiplied by 1.5. For example, if you have an appliance rated at 100 watts, you will need to pick a transformer with a maximum power of 150 watts or greater.